Give the gift that keeps on giving. 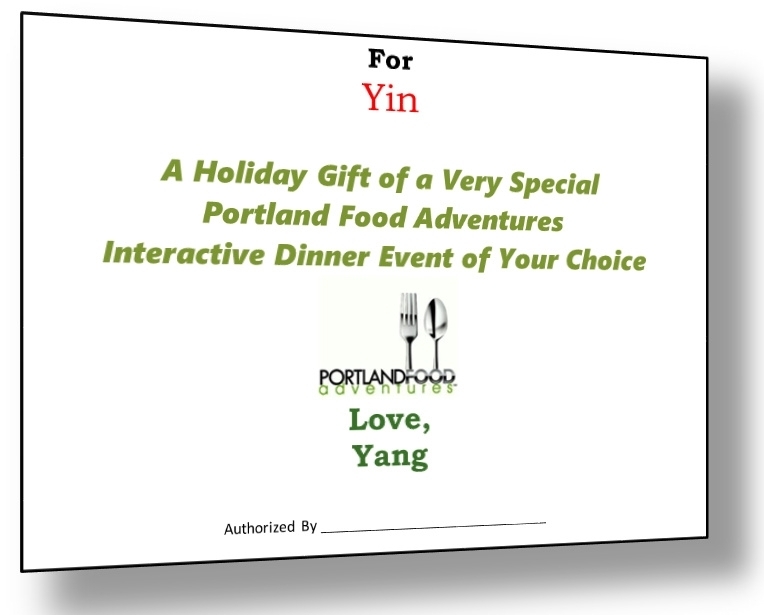 When you give a Portland Food Adventures gift certificate, your recipient will not only enjoy a wonderful interactive paired dinner, but they'll leave with gift certificates to try the chef's favorite places. Please fill out the form below and we will email you back or call to make sure yours is right, and delivered on-time. We can snail mail you a card, or send you a PDF for you to print out if time is of the essence. We can take your credit card over the phone or send you a PayPal invoice. Suggested denomination is $130 or $260 for a +1. $5 for for handling. Just so we can call you to make sure everything is right. Where should we sent the gift certificate? Is this address to you or direct to your recipient? 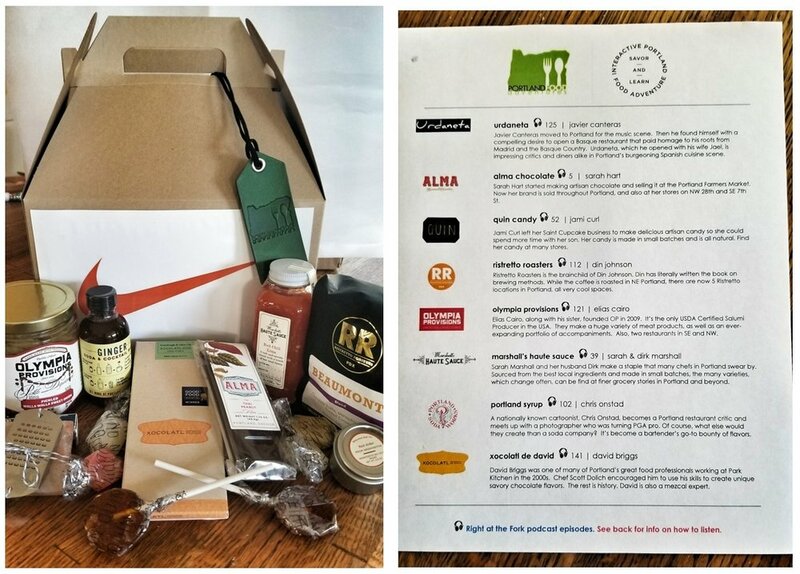 Our standard 2018 package has $50 worth of premium products: Commonly, Alma Chocolate and Xocolatl de David chocolate bars, Portland Soda Works Syrup, Ristretto Coffee, Olympia Provisions Pickled Onions, Marshall’s Haute Sauce Red Chili Lime sauce & Quin Candy (subject to change). For orders of 10 or more, pricing is $59. per box. 5 – 9 boxes is $65 each. That includes: Standard white box, assembly, tissue, email delivery of PDF info sheet (which you can customize and print and insert) and box delivery. Customized boxes with your logo added to the front of the box and info sheets on premium glossy paper are a flat $50 the first time you order, no matter how many boxes you order. And then $4 per box after that if we use the same design and copy. For annual subscriptions of 60 boxes or more, all customization fees are rebated or credited once 60 boxes are purchased. Payment by Venmo or check COD, please. Ask about having a link/embed code with all episodes in one playlist with your personalized message added at the top of each episode!